In the collective, selective, ‘deerhounds with everything’, nature of my blog, cigarette, as well as various other collectors cards have been featured - so here’s yet another. Produced at sometime during the UK reign of King George V or VI, this little work of art includes a condensed breed history and descriptive standard from that period. It was printed as a promotional incentive to entice shoppers into choosing Fry’s Chocolate, yes . . . that’s the chocolate company that turned relaxing into an art. Judge as you will the card - but enjoy ! Here’s a wee box o treats to chase awa’ the Monday mornin’, mischief makin’ blues. 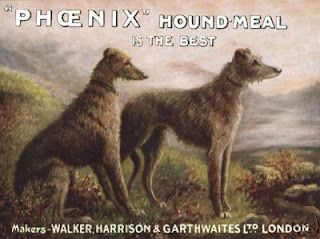 I discovered these whilst playin’ deerhound fetch on the super-info highway. They are available at the Fetch Ave ebay traders website - click the go button and tell em Rogue sent you. Well, we’ve had a home / kennel (call it what you will) re-fit week here at Rogue acres and little time to be blogging. But any resident hound in Scotland might be interested in responding to the Consultation on the Draft Dog Welfare Code of Practice: A Consultation Document issued by the Rural Directorate of the Scottish Government. Use your hound sense and as per usual click the above links or if you prefer download the pdf here. If you are a Scottish deerhound or deerhound owner or breeder living in Scotland (or any canine or canine owner for that matter) - it’s your civic duty to respond. You only have until the 1st of May, best get them paws busy. Well that’s a bit of a ‘Blogger’ - it appears that someone has taken umbridge at the Rogues blogspot and reported it to blogger as a ‘spam’ site. Having keen hound sense and a close family of web-hounds, plus being armed with google analytics, we know who, where and when this report came from - very sad! But unfortunately, folks probably won’t get to read this post before the event we are blogging on, or who knows - if ever? 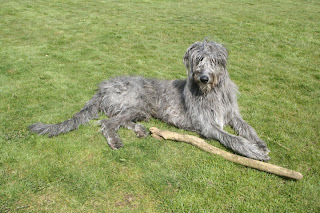 This weekend - Saturday the 12th of April 2008 will find deerhounds a-plenty in the raiding-lands of the Scottish Borders at the Border Union Hound Show of Scotland - click the link for further details. And in the meantime - enjoy a Hei’land car park technology troubleshooting session . . . we are not spam - we chase it!